This photograph is part of Mitch Epstein’s series Family Business, which traces the decline of Holyoke, Massachusetts, a once-prosperous industrial town, through the example of his own family’s waning fortunes. The series’ central character is Epstein’s aged father, whose downtown furniture store went bankrupt and whose rental properties deteriorated. 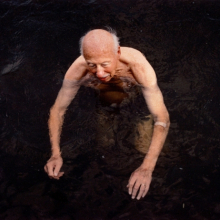 Dad, Hampton Ponds III, a monumental and vulnerable portrait, shows the artist’s father partly submerged in water and with an adhesive bandage on his arm; it is an image about frailty and the difficulties of aging. Like others in the series, the photograph transcends its context of small-town America and becomes an emblem of the fragility of life. In the portfolio Samar Hussein, Vera Lutter commemorates the civilian deaths caused by the war in Iraq since the invasion on March 20, 2003. The title derives from the name of the thirteen-year-old Iraqi girl who was the first recorded civilian casualty. Lutter adopts images of a hibiscus flower’s life cycle, from the opening of the bud to the blossom’s final disintegration, as a metaphor of the transience of human existence. 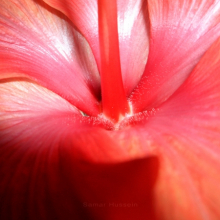 The petals’ reds, pinks, and ivories, which mimic the tones of human flesh, further underscore the comparison. 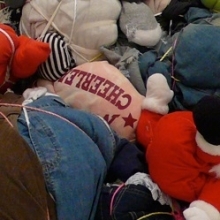 Sitting directly on the floor, like a Minimalist sculpture, Mitumba Deity consists of lumpy bundles of fabric, stuffed toys, and articles of clothing. Composed of Smith’s own garments and those of friends, the piece alludes to the global economy through the path of secondhand clothing. The piece was inspired by a film that tracks a T-shirt with a university logo from a thrift shop in New York to a mountain village in Africa, where it is purchased by a man and becomes his second shirt. Mitumba is a Swahili word that can be translated literally as “bundles”; it refers to the packages and articles of used clothing donated by people in prosperous countries to charitable causes. Mitumba Deity is from Smith’s series of bundle sculptures. Combining a Minimalist-inspired aesthetic with a love of ordinary materials such as drinking straws, pencils, adhesive tape, and paper plates, Donovan creates delicate but monumental sculptures that evoke forms found in nature. To compose this work, she rolled sheets of Mylar to form cones and then glued these smaller units together to create molecular modules. 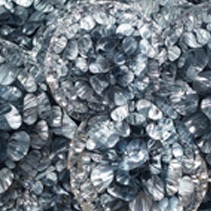 Characteristically, Donovan exploits the properties of her material—in this case, the reflective surface of Mylar, which responds to light in different ways. In a delicate group of black-and-white photographs, Dash Snow captured his family and extended family of friends in an intimate and unguarded fashion. 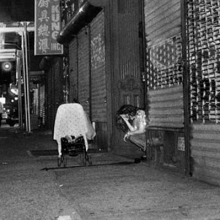 In this diaristic image of Chinatown at night, a young woman (Snow’s partner, Jade) sits in a doorway with a child’s stroller on the sidewalk close by. She seems despondent, head in hand, or just tired after a long night out (Dash forgetting the house keys, or so the story goes); the mundane snapshot is full of emotion. Best known for his often candid Polaroids, Snow received much attention over the past few years. An elusive graffiti tagger turned visual artist and Whitney Biennial participant, he was part of a tightly knit group of downtown artists who turned life into art in a manner associated with Nan Goldin, Larry Clark, or Wolfgang Tillmans. 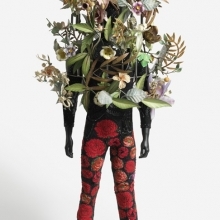 Nick Cave’s Soundsuit transforms the human body into an ornate still life. Since the early 1990s, Cave has been fabricating such inventive sculptures out of scavenged materials that he often overlays with beadwork, stitching, and other sorts of embellishments. One of his first Soundsuits, crafted from twigs, was made to be worn. In response to the movements of the wearer, it generated rustling sounds, giving a name to the resulting body of Cave’s work. The Soundsuits, which allow the wearers to assume new identities, allude to a range of rituals, from ceremonial African dances to Christian liturgy. Reflecting his training as a dancer, Cave’s creations explore the expressive potential of the body moving through space and as a support on which to compose with readymade materials. In the face of the social upheaval of the past few decades, the family has remained territory that is routinely explored in art. 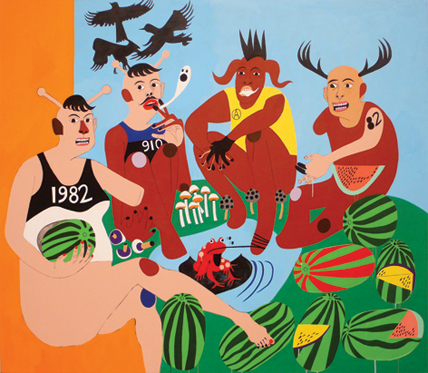 The intergenerational selection of work on view in this installation demonstrates that familial relationships continue to provide a rich source of artistic material, while the concept of the family has also been extended beyond blood ties to embrace larger groups or communities united by shared values, identities, lifestyles, or emotional needs. The artists express fluid definitions of the family and domesticity, drawing on experiences that are private and public, individual and communal. As members of a community that is both homegrown and globetrotting, many of the artists in this installation also transcend national boundaries, representing a new twenty-first-century breed that travels to create work in cities around the world. Extended Family: Contemporary Connections highlights recent acquisitions and presents them alongside notable works that entered the collection over the past five decades. The Museum’s contemporary collecting focuses on art of the twenty-first century, which has seen the rise of Brooklyn as one of the most vibrant centers of cultural production in the world. Williamsburg, Greenpoint, and Dumbo—now established artists’ enclaves—have given way to Red Hook, Bed-Stuy, the Gowanus Canal, and Bushwick as frontiers that offer artists prospects for affordable studio spaces. The Brooklyn Museum has collected contemporary art since the mid-nineteenth century. Extended Family demonstrates the Museum’s continuing commitment to living artists and to collecting distinctive art of our time. The exhibition is co-organized by Eugenie Tsai, John and Barbara Vogelstein Curator of Contemporary Art, and Patrick Amsellem, Associate Curator, Photography, Brooklyn Museum. The generous support of the John and Barbara Vogelstein Contemporary Acquisitions Challenge has made possible many recent additions to the collection featured in Extended Family: Contemporary Connections. This exhibition was also made possible in part with support from the FUNd. The creation of the new contemporary galleries was made possible in part through support provided by the New York City Council through the efforts of Council Member Bill de Blasio. 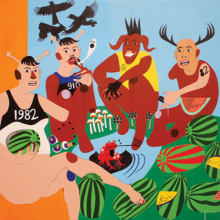 Artist Nina Chanel Abney talks about her work Forbidden Fruit. Artist Vadis Turner (in a bridal gown!) gives a quick tour of her work Reception. Photographer Mitch Epstein talks about his work from the series Family Business.